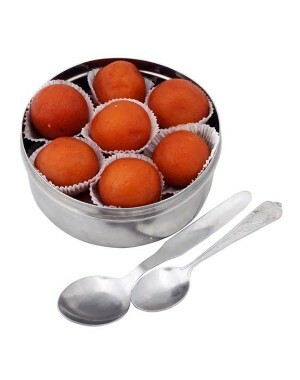 Original taste of gulab jamun from Kolkata. Shelf life is of 7 days. Being one of the prominent brands in India, we provide sweets and namkeen products that are considered as the traditional and hospital products. To buy sweets online India, ours is the well known brand spread across various states and cities and is recognized by the namkeens, sweets, gift packs and the multi-cusine restaurant facility. Our motto has always been feel and be happy which we achieve through Online Sweet shops in Kolkata. The various attractive and designed gift packs for corporate agencies is something that you ought to watch out for. Since a happy employee is what makes an organization happy and productive, each of the corporate gift pack has sweets which are hand selected and chosen with utmost care. Being one of the prominent brands in India, we provide sweets and namkeen products that are considered as the traditional and hospital products. To buy sweets online India, ours is the well known brand spread across various states and cities and is recognized by the namkeens, sweets, gift packs and the multi-cusine restaurant facility. Our motto has always been feel and be happy which we achieve through Online Sweet shops in Kolkata. The various attractive and designed gift packs for corporate agencies is something that you ought to watch out for. Since a happy employee is what makes an organization happy and productive, each of the corporate gift pack has sweets which are hand selected and chosen with utmost care. An Indian sweet consisting of a ball of deep-fried khoa boiled in a sugar syrup. Uniquely made by Gupta brothers. Products are made up of pure and natural ingredients.